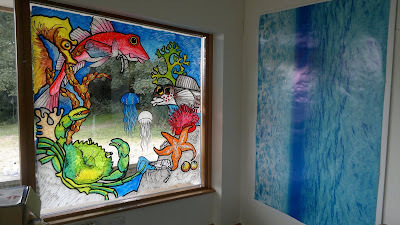 More Than Art: Marine Awareness! Was very happy with the marine themed window art recently comissioned by Bedfords Park, for marine conservation awareness. Pop along and show your support by signing the petition to stop valuable marine habitats around the UK being destroyed and to make them 'conservation' zones. Can you spot Bernard the Gurnard? I like that piece. The colors are striking and drag my eyes in a circle, just to keep looking at the variation of colors that keep popping out.